Fate & Fortune is a rules-light system with a heavy emphasis on story-telling. It is a game system that works best in genres that have frequent risks or challenges to overcome, such as Horror, Action-Adventure, Mystery, and the Wildly Supernatural. Players take on the roles of accidental or intentional adventurers who are frequently poorly equipped to deal with their circumstances and must manage to survive with what they’ve got. Fate and Fortune is available as a downloadable PDF. Download it for free, or pay as much as you want! Fate and Fortune is released under the ‘Pay What You Want’ model, so you can always feel like you’re getting a good deal. Fate and Fortune is intended to be as simple as possible, while still maintaining that sense of tension through gambling and risk. Game mechanics are largely abstracted, and storytelling is central to the experience. Fate and Fortune games are intended to be structured like films, containing scenes where players are given a general objective to play out as their characters. The direction of the game changes with the results of each scene. 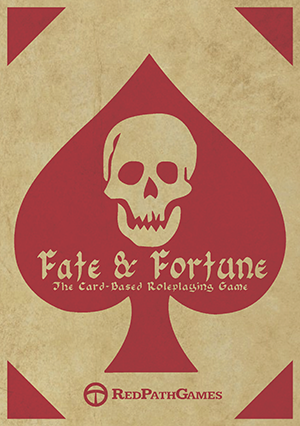 Fate & Fortune is a card based roleplaying system using two decks of standard playing cards, one representing Fate, and the other representing Fortune. Alternatively, players may use the custom-made playing cards designed specifically for playing the game. 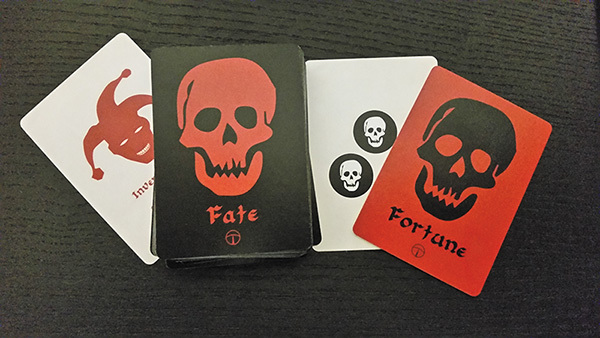 Players of the Fate & Fortune system can now also order the custom Fate & Fortune decks. These premium color playing cards are printed on standard card stock with a low-gloss UV coating, and are purpose-made for Fate & Fortune.